The Single Port Forwarding feature allows you to apply rules on your router where one (1) particular port is open to receive a requested data. This feature helps in increasing connectivity and speed especially when you’re playing games, streaming or downloading. Configuring the Single Port Forwarding feature of your router is made easy using the Linksys app. You can even set up Single Port Forwarding on your router remotely. Write down the ports you need to forward. Refer to your product documentation or contact your device manufacturer for details. Write down the IP Address of the client you will need to configure Single Port Forwarding for. Static IP Addresses should be assigned to the designated computers or servers before using the Single Port Forwarding feature. Tap the Menu icon (three bars). Tap on Single Port Forwarding. Enter the details for the Rule Name, External Port, Internal Port, Device IP Address and Protocol. NOTE: You can also tap on Select a device to select a client that is already on your network. 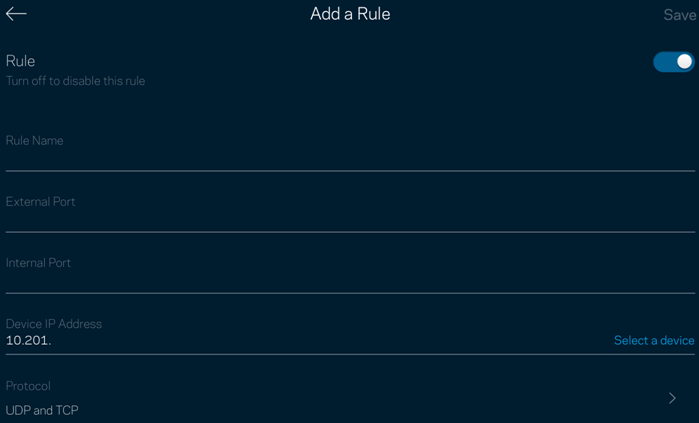 QUICK TIP: You can tap on the slider button to activate or deactivate the Rule you have configured. You have now successfully configured the Single Port Forwarding feature of your router.